Dinner's at eight, but you just can't wait...try one of these nine healthy snacks to tide you over. Think of this as a gourmet cook's PB & J. 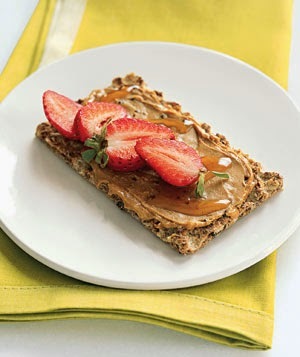 Spread 1 tablespoon of cashew butter on a slice of Ryvita Fruit Crunch. (Or substitute peanut butter and Triscuits.) Drizzle with ½ tablespoon honey and top with sliced strawberries. Health bonus: Nut butters are full of heart-healthy monounsaturated fats. 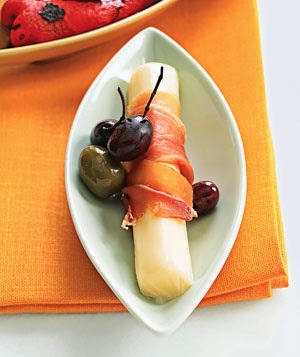 Roll a thin slice of prosciutto or ham around a part-skim mozzarella string cheese. Eat with a few olives and grapes, or add roasted bell peppers (from a jar) drizzled with balsamic vinegar. Health bonus: Contains almost a quarter of a woman's 1,000-milligram recommended daily allowance for calcium. 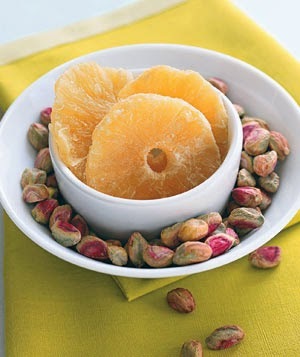 Combine about ¼ cup dried pineapple pieces with about 25 pistachio nuts. (For a treat, use chile-lime pistachio nuts, available at specialty stores.) Other winning dried-fruit-and-nut combos: raisins and peanuts, apricots and almonds, cherries and hazelnuts. Health bonus: Pineapple and nuts are both good sources of antioxidants. 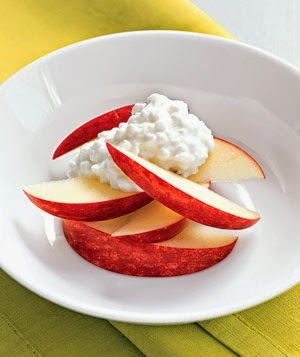 Slice an apple, such as Fuji or Granny Smith, and top with ½ cup of low-fat cottage cheese (look for 4-ounce four-packs from Breakstone). Or replace the fresh apple with two drained cinnamon-spiced apple rings, such as Musselman's (which can be found in the canned-fruit aisle). Health bonus: Provides protein, calcium, and fiber. Spread ½ teaspoon of spicy mustard on a cocktail-size slice of thin whole-grain rye bread. 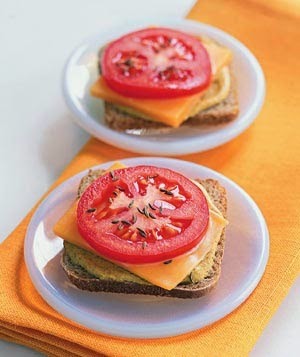 Add a thin square of sharp Cheddar (about the same size as the bread) and broil until the cheese melts, then top with a slice of tomato and a sprinkling of caraway seeds. Health bonus: Rich in calcium. 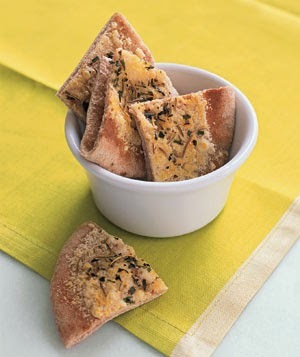 Sprinkle 2 tablespoons of grated Parmesan evenly over a 4-inch whole-wheat pita. Dust pita with ¼ teaspoon dried oregano and broil until the cheese browns. Cut into quarters. Health bonus: Good balance of protein, fat, and fiber. Place 2 cups plain nonfat yogurt in a sieve lined with a coffee filter. Let stand in the refrigerator for 1 hour or overnight. Discard the liquid and spoon the thickened yogurt into a small bowl. Add ¾ cup (3 ounces) crumbled Feta cheese, 2 cloves minced garlic, 2 tablespoons finely chopped toasted walnuts, ¼ teaspoon freshly ground black pepper, and ¼ teaspoon hot sauce. Mix well. Cover with plastic wrap and refrigerate for at least 2 hours to allow the flavors to blend. Makes 1½ cups. 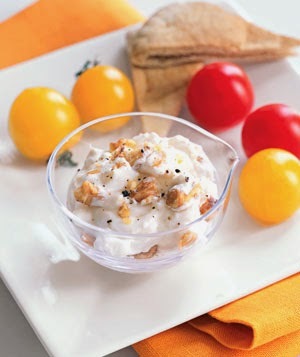 Pair Feta-Walnut Dip with cherry tomatoes, a whole-wheat pita, or baby carrots. Health bonus: An easy way to get calcium, protein, and monounsaturated fat. 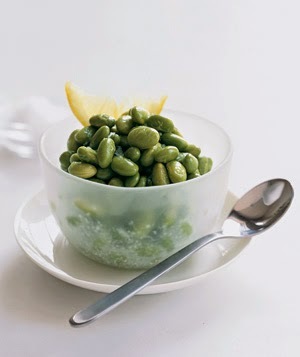 Grab a handful of frozen shelled soybeans and run them under steaming-hot water for a quick thaw. For a tangy twist, add a spritz of lemon. Health bonus: Contains 8 grams of fiber and lots of cholesterol-lowering soy protein. Slice a cucumber into strips and place on a plate with baby carrots or baby corn. 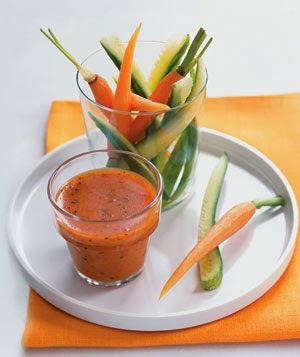 Dip in a lower-fat dressing, such as Annie's Naturals Roasted Red Pepper Vinaigrette or Trader Joe's Carrot-Ginger. Health bonus: Fiber-rich and very low-calorie.